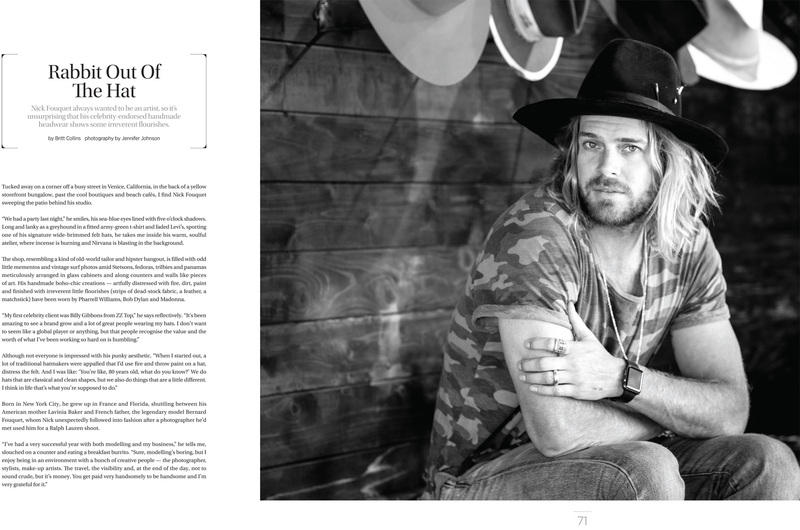 Tucked away on a corner off a busy street in Venice, California, in the back of a yellow storefront bungalow, past the cool boutiques and beach cafés, I find Nick Fouquet sweeping the patio behind his studio. “We had a party last night,” he smiles, his sea-blue eyes lined with five o’clock shadows. Long and lanky as a greyhound in a fitted army-green t-shirt and faded Levi’s, sporting one of his signature wide-brimmed felt hats, he takes me inside his warm, soulful atelier, where incense is burning and Nirvana is blasting in the background. 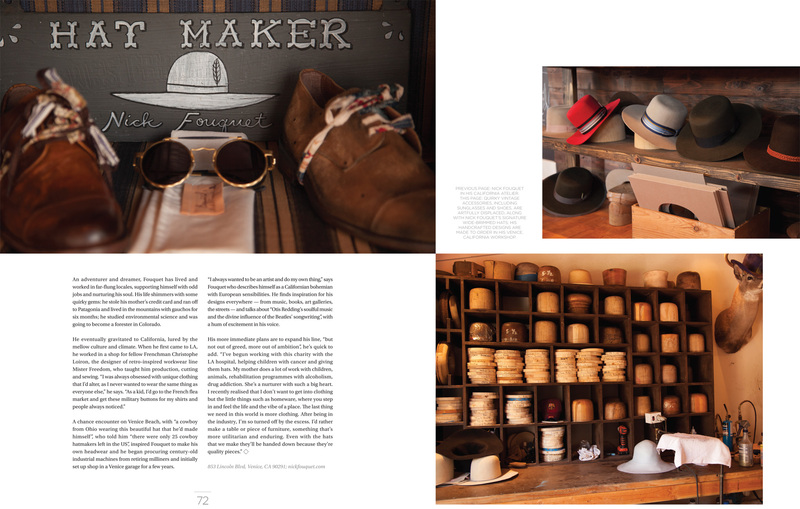 The shop, resembling a kind of old-world tailor and hipster hangout, is filled with odd little mementos and vintage surf photos amid Stetsons, fedoras, trilbies and panamas meticulously arranged in glass cabinets and along counters and walls like pieces of art. His handmade boho-chic creations — artfully distressed with fire, dirt, paint and finished with irreverent little flourishes (strips of dead-stock fabric, a feather, a matchstick) have been worn by Pharrell Williams, Bob Dylan and Madonna.